This blog is a work in progress, as is the Temple. For photos & updates, see the Progress Posts (in the right column). The Temple of the Cosmos is a tent-like, room-sized fabric portable environment. Using diaphanous textiles, it imaginatively depicts our cosmic and Earthly history on its ceiling and walls. The structure may be set up indoors or out, during the day or night. At night, the Temple is illuminated by solar LED lights. People have asked to use the Temple for weddings and receptions, rituals, and teaching. When it is complete I’ll be happy to share it in many venues, indoors and out. Thank you! This a long-term project. Someday it will be complete. I found you on the RN Yahoo group, where I followed the link for your blog. This and your ceilings look beautiful and would fit well at Burning Man, especially as there are weddings and sacred events there. Thanks, Brent. Maybe someday I’ll have an opportunity to bring it to Burning Man. I enjoyed your photos this year! Saw an image from your wonder-full Temple in a lesson from the Monk Manifesto. Your image captivated me. Thank you for your Beauty. Progress Posts: newest is listed first. 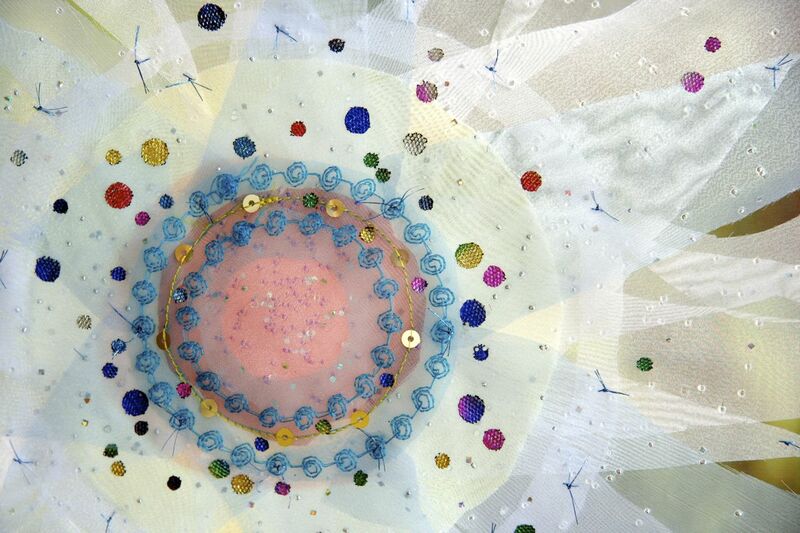 The creator of the Temple is Katharine, who earned her BS in Design in Fibers from the New York State University College at Buffalo, NY, and has exhibited her work in museums and shows regionally and nationally. Her work is her play! All images, text, photographs, and designs on this site are copyright © 2010 - 2018 by Katharine Houk, unless otherwise noted. Please respect my rights as an artist and do not copy, re-post or re-use anything from this blog without express written permission. Thank you!